Laws protect the rights of a nation's citizens, but with regards to American slavery, were used as a tool to advance both pro- and anti-slavery efforts. Our understanding of the arc of American slavery and its aftermath is informed, in part, by the push and pull of laws that mark shifting social, political and economic environments. For instance, the Missouri Compromise of 1820 added Missouri as a slave state and Maine as a free state. This guaranteed equal slave-state to free-state representation in the United States Senate, and also imposed geographical restrictions on where slavery could be practiced. By 1854, with two new territories entering statehood, the Kansas-Nebraska Act repealed the Missouri Compromise (and its restrictions), thus adding fresh fuel to the pro/anti-slavery discourse leading up to the Civil War. Looking at history solely through the prism of federal law in part distances us from the events that played out in city and county courts across the U.S. It is through primary evidence that we begin to understand the struggle for African Americans to claim rights secured by law. By looking at these documents we improve our understanding of what it meant to be enslaved versus free. Special Collections and Archives holds three collections of legal records documenting slavery and freedom through the Civil War. 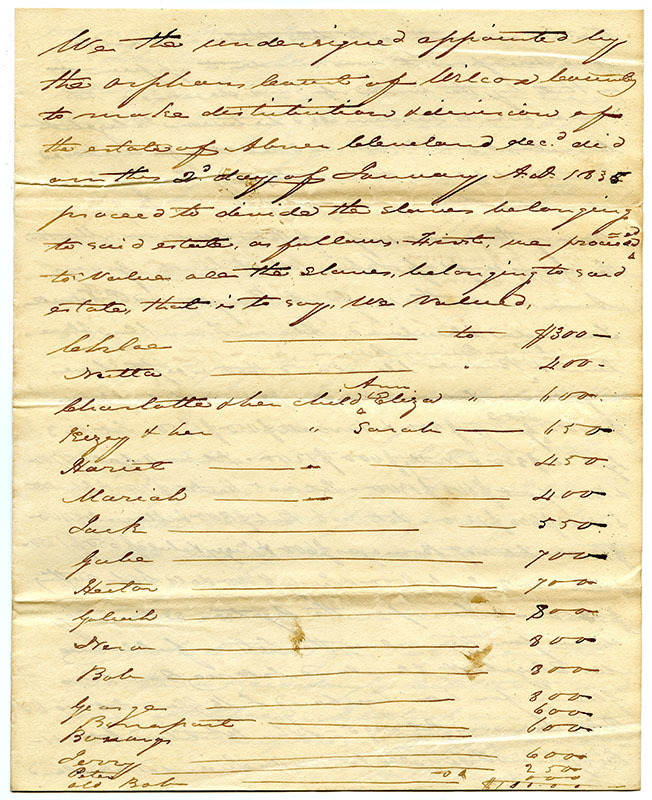 The Legal and Financial Documents on Slaves and Slavery in the United States Collection, 1756-1869 contains bills of sale, bonds, writs, promissory notes, summons, wills of slave owners and slave inventories. Largely abundant are records from Alabama and other south eastern states. These records document the experience of slaves as a commodity undergoing legal valuations and appraisals as estate property. Like other commodities, slaves were bought, sold, rented and redistributed. 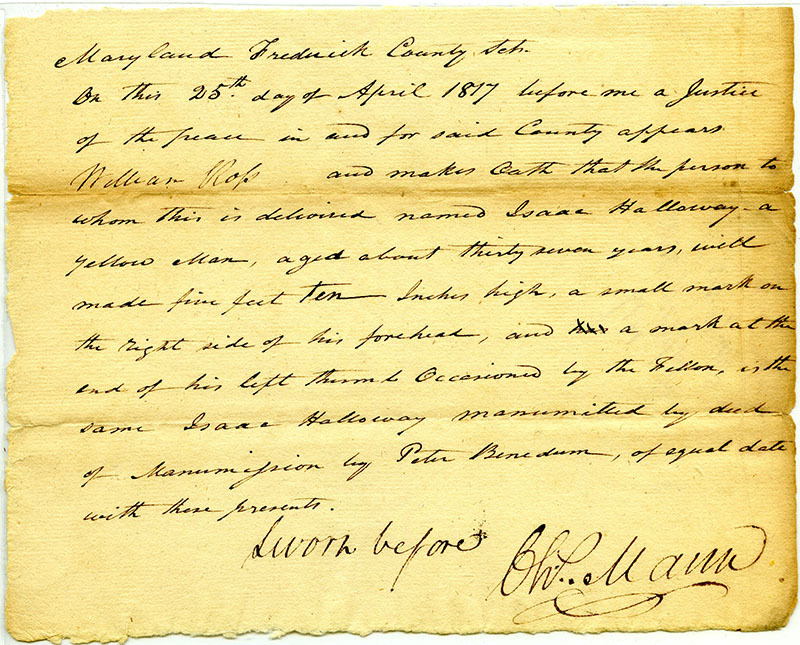 Hand-written contracts in the collection document agreed prices and payments made to slave owners for the temporary services of slaves. 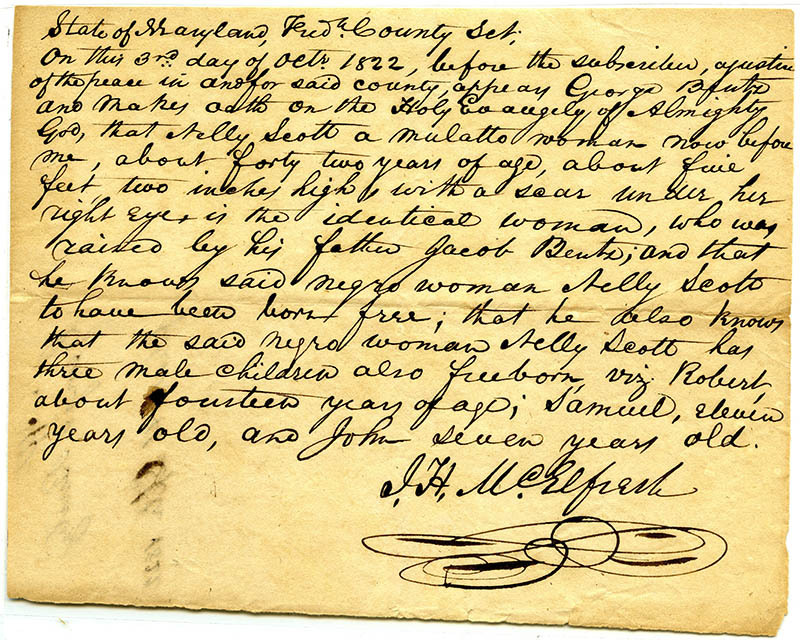 These documents reveal the stark realities of the slave trade. As more territories entered into statehood, the number of free states increased. 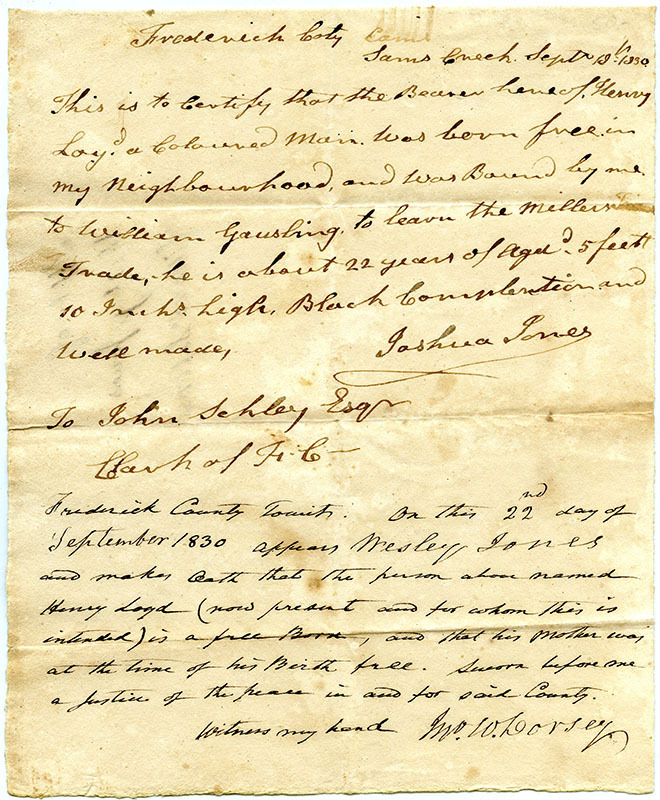 New legal restrictions confining the slave trade (such as the ban on slave importation in 1808), left many free individuals as targets, vulnerable to having their status questioned. Without personal documentation to prove one's status, free individuals often required witnesses to vouch for their identity or face consequences. This resulted in a period of black dependency on others for their own security. The Free Status Affidavits Collection, 1817-1857 contains five affidavits of black individuals legally proving their free status. The collection consists of statements made under oath by witnesses on the behalf of the persons in question and written under judicial authority. Immediately following the Civil War, African Americans continued to endure abuse. Though the 13th Amendment abolished slavery, it could not effectively protect free-born blacks and former slaves from harassment and mistreatment, particularly in areas that were politically opposed to abolition and equal rights. The Captain William Royal Journal and Account Book, 1867-1883 documents the efforts of a local Georgian official in monitoring the peace between African-American and White communities. 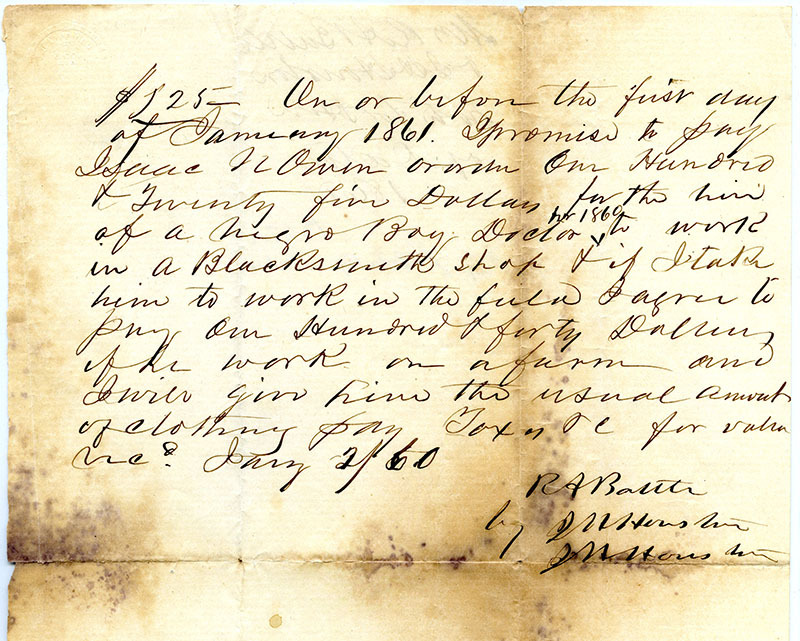 Captain Royal’s journal includes complaints of abuse and illegal activities perpetrated against African Americans. 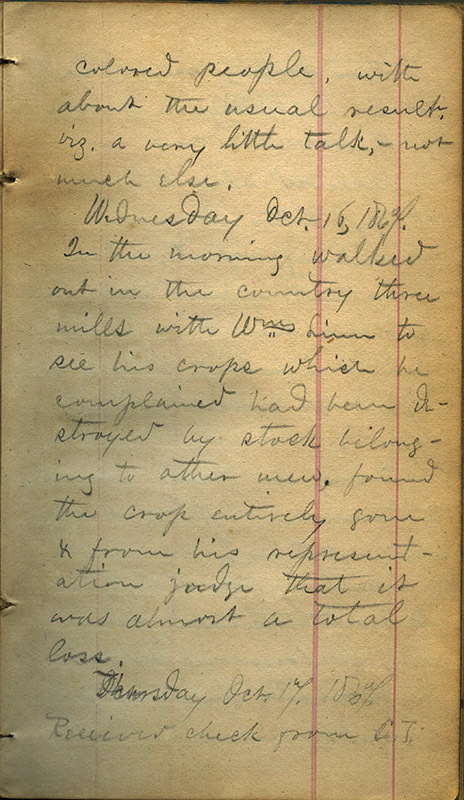 The journal illustrates the deep animosity felt by whites towards the African-American community in the South after the war. These collections provide us with evidence of slavery and freedom in the United States, and exhibit the role laws have played in both the institutionalization of slavery and its destruction. Slavery's social, political, and economic consequences continued into the modern era. Indeed, laws regarding segregation, civil rights, affirmative action, and other policies are still relevant today. Browse the Digital Collection of documents.